Join us for a 1.5hr leisurely river cruise including complimentary cake, tea/coffee, & a fun facts commentary. Please include all kids under 3 in the booking under infants. Cruising the rivers, canals, marina & broadwater of the Gold Coast, this morning river cruise is a sure way to enjoy an a beautiful Gold Coast morning. This leisurely 1.5hr smooth water cruise is complimented by a fun facts filled commentary about property prices, history & famous people. The upstairs viewing deck is great for a brilliant photo opportunity or just sit back & relax in the sunshine. The cruise travels the Surfers Paradise canals, viewing the homes of the rich & famous, out to the Marina, past Palazzo Versace Hotel, the Gold Coast broadwater & then back to Surfers Paradise. This is a must do for tourists & locals alike. Your 1 ½ hour morning cake tea/coffee cake cruise on Surfers Paradise River Cruises will be a spectacular start to a glorious Gold coast day. The best value canal, river & broadwater cruise on the Gold Coast. Enjoy a relaxing cruise on the smooth waters of the Gold Coast. You can choose to sit on the open sundeck or the comfortable inside seating. We’ll cruise through the Surfers Paradise waterways, rivers, canals and onto the broadwater. We pass mansions & helicopters of the rich and famous before heading out into the main channel of the Nerang River and then onto the Gold Coast’s Marina Mirage. The Gold Coast has a huge boating population & you’ll get to see some of the small and not so small toys of the rich as we pass Southport Yacht Club. We’ll point out the homes of the rich and famous plus show you where popstars stay when they visit the Gold Coast. This smooth water cruise will be the highlight of your Gold Coast holiday - have your camera ready for the spectacular skyline of Surfers Paradise. The cruise also includes complimentary snacks. Join us for a 1.5hr leisurely river cruise including complimentary snacks & a fun facts commentary. Please include all kids under 3 in the booking under infants. Cruising the rivers, canals, marina & broadwater of the Gold Coast, this afternoon river cruise is a sure way to enjoy an a beautiful Gold Coast morning. This is a must do for tourists & locals alike. Your 1 ½ hour afternoon sightseeing cruise on Bluewater Cruises will be a spectacular start to a glorious Gold coast day. 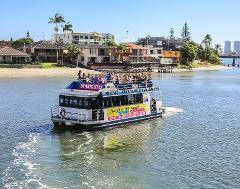 Surfers Paradise River Cruises sunset sightseeing cruise will be a spectacular finish to a glorious Gold coast day. Please include all kids under 3 in the booking under infants. This Gold Coast broadwater canal & river Cruise is designed specically to give some much needed relaxation time. While nibbling on the complimentary savouries enjoy a glass of champagne or a nice cold beer from the fully licenced bar. Gold Coast broadwater & then back to Surfers Paradise. Cocktails are available for purchase.